Yes, you can be Fabulous and Fashionable over Fifty! I love fashion. As a child I spent hours designing dresses for my Barbie dolls and walking them down the imaginary runway on my bedroom carpet. As you get older there is a little voice in your head which says that you cannot be fashionable over fifty. You shouldn’t stand out, and the best one ever – never turn into mutton dressed up as lamb! For the past couple of years I have watched the media and read blog posts on fashion and felt simply green with envy. A little while ago I decided that I would blog about fashion for the plus sized and for woman of a certain age. I am proud to say that this has been a much viewed blog post. 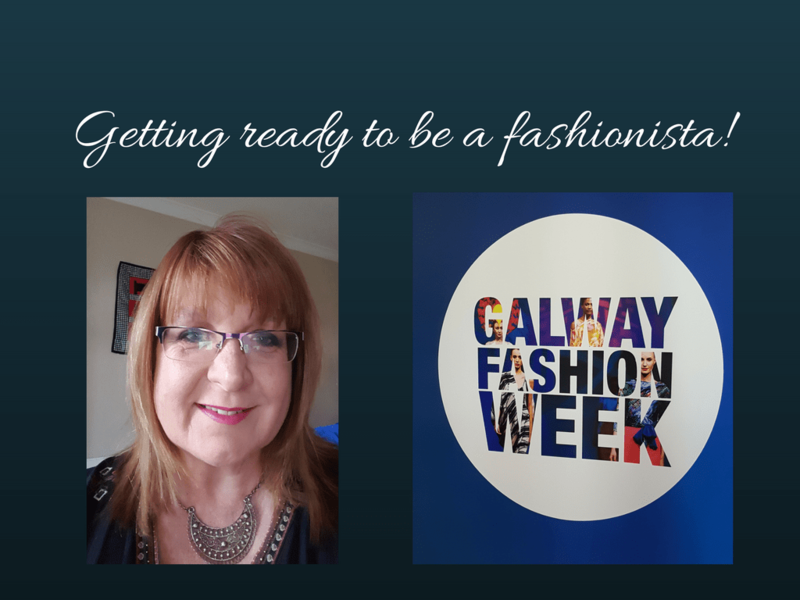 Last Saturday I joined the Galway Fashion Trail presented by Galway Now Magazine. It was a simply fabulous day and I can honestly say that I have learned that age and size does not determine whether you can be fashionable. 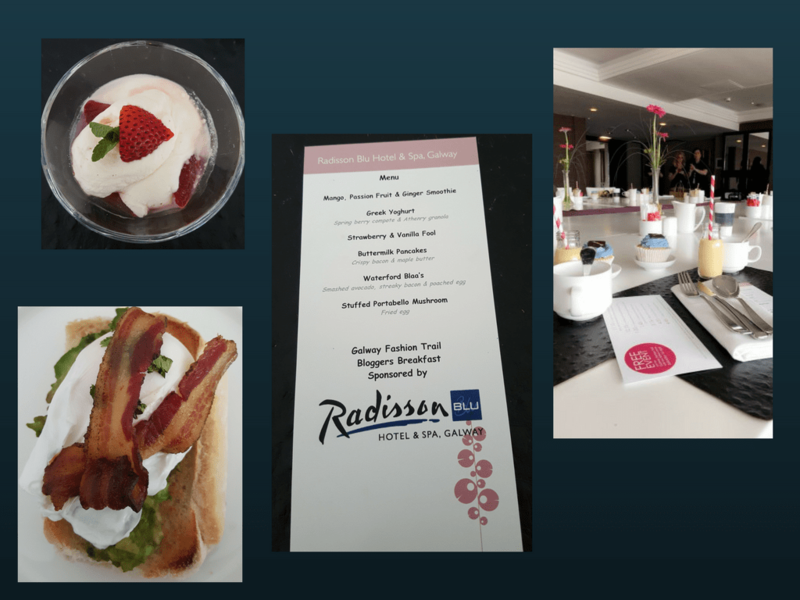 The day started with a stylish, and most delicious breakfast at the Raddison Blu Hotel in Galway. We whizzed up to the top floor where the view was simply wonderful. After enjoying this amazing breakfast we watched the first of the fashion shows featuring styles from Harpers and headpieces from Brid o’Driscoll Millinery and Majella Lennon. I started my day by treating myself to two beautiful necklaces from Jewelbox.ie. I fully intend paying a visit to the other exhibitors, Sheniel Shoes and Optique Opticians soon. As this was a fabulous day, we were chauffeured by Bradley Renault to our next stop. At Sarah Mason where we learnt about the hair from Sarah and about make-up from Aisling K. I was feeling glamorous already. 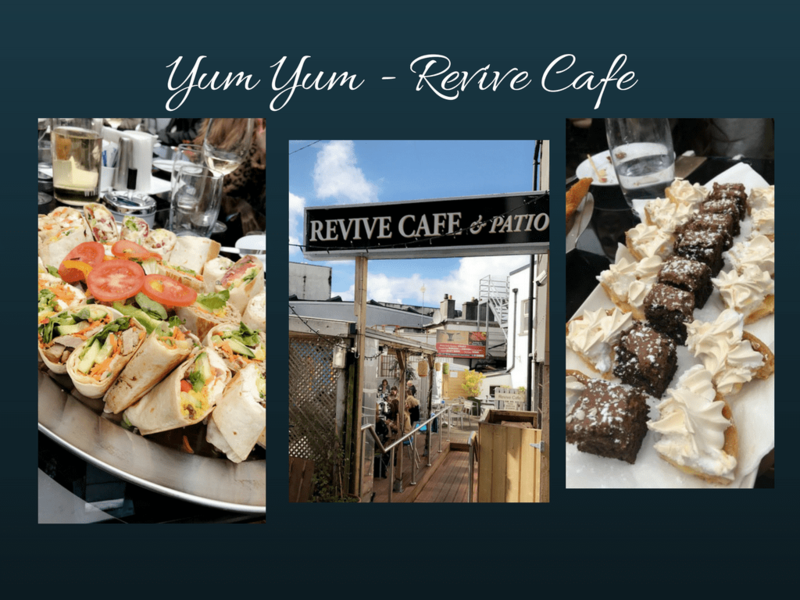 The day of fashion shows and food at Swamp, Greenes Shoes, Colette Latchford, Revive Café, Brown Thomas, Choice Boutique and Willow was like a full immersion in fashion. I found myself feeling so excited as I watched the models on the runways showing off clothes and accessories. I fell in love with some seriously amazing fashion from House of Mowhawk an IFIA finalist. There were some big take-aways for me, as a plus-sized 52 year old. What I learned is that you can take lessons and inspiration from fashion shows and magazines, from following Instagram and Facebook accounts and of course reading fashion blogs. Learn and then twist it to make it your own. 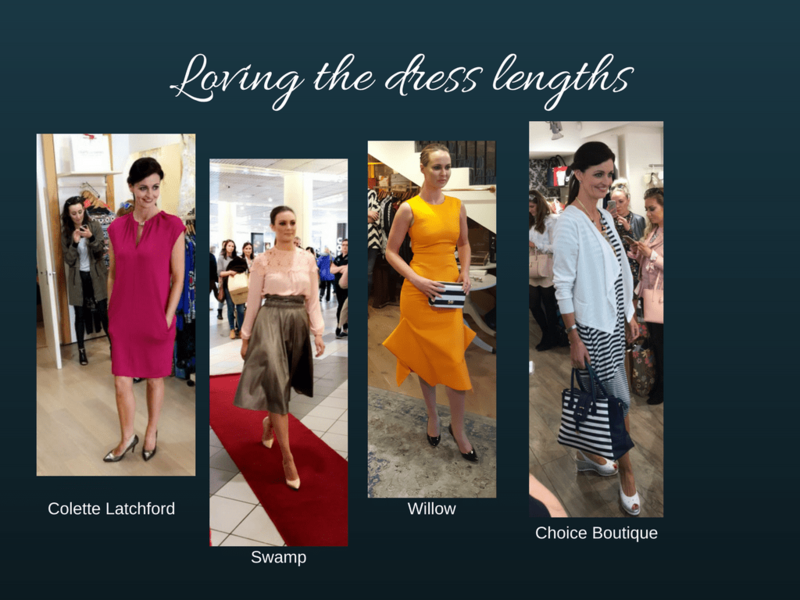 These are my fashion lessons from the Galway Fashion Trail.. There are always new season colours. Pick the colours that work for you and add them into your wardrobe to update them. I love the dusky rose pink of this season and already have a fab pair of shoes and will be adding more – maybe a handbag! The other colour that really popped for me was tomato red! My all-time favourite royal blue also make an appearance which made me smile. Scarves are a beautiful way of making a statement. 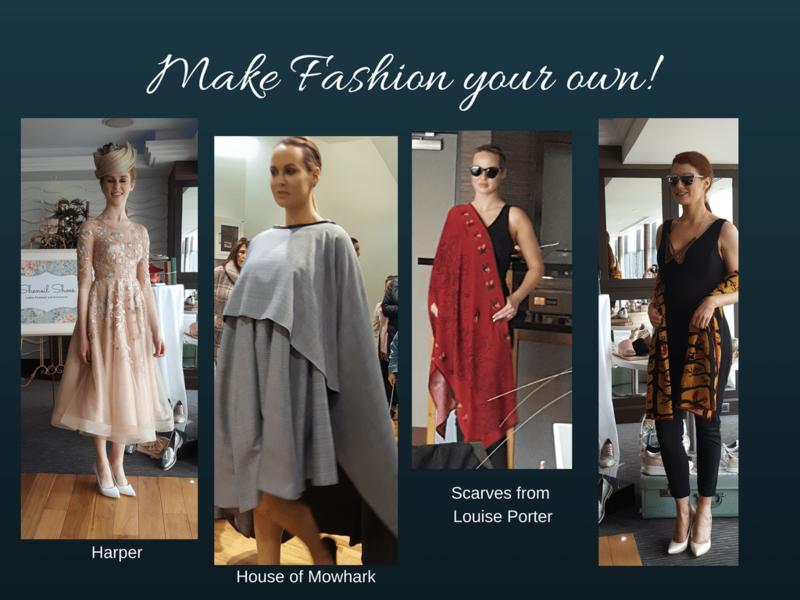 We were gifted some beautiful scarves from Swamp and Willow but also saw some amazing designer items from Louise Porter and Niamh Daniels both IFIA finalists. I will be adding scarves to my birthday list. Jewellery is a great way of making a fashion without trying to be too trendy. 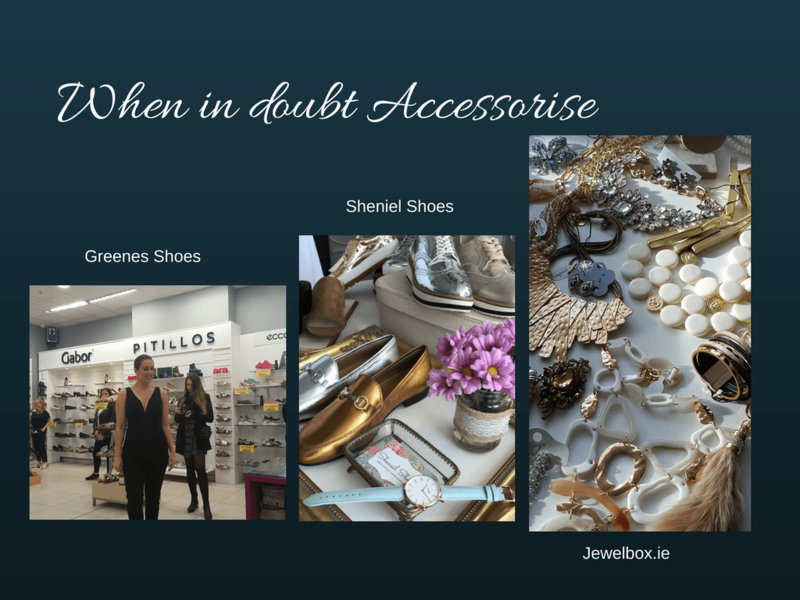 Jewelbox.ie have some great fashion pieces in rose gold that shout this season. I bought two pieces and will be featuring them in a new blog post soon. Dress lengths are great at the moment. The models showed off some amazing dresses at most of the shows that were on the knee or mid-calf. This is such a flattering length. Don’t judge a book by its cover. When we visited Swamp I immediately thought that there would be nothing I liked. I was wrong. There are quite a few items that are larger in size and might just be updating my wardrobe. Lesson learnt – go into boutiques and stores, and wander around with an open mind. When in doubt, go with your instincts and wear what makes you feel fabulous. Finally I generally buy things when I really love them. I might spend a little more, but I know when I love something, it fits well and makes me feel fabulous, I will wear it!. I really want to say thank you to Golden Egg Productions and Galway Now for hosting this wonderful event. And to all the lovely bloggers many of them much younger than me who welcomed me and made me feel fashionably fabulous. 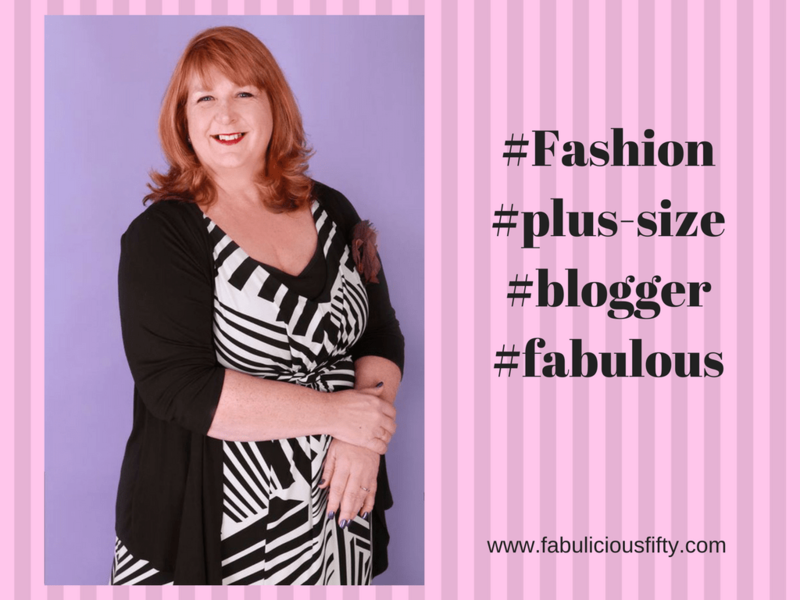 I am a proud member of the ITWBN and the Irish Blogger Agency who invited me to be a fashionista at 52. Thank you! PS – Thank you to Sinead from Yummy Mummy who helped me with photos! I am determined to be fabulous no matter what. For many woman that no matter what includes Urinary Incontinence (UI). It is something we feel ashamed about and don’t like to talk about. A little while ago I was approached by Always Discreet to write a blog post about it. I thought about it quite a bit, because even for me this was very bold and brave. The reason I decided to talk about it was because it is a real issue. It affects so many woman and we shouldn’t be ashamed of it. We should be able to access the solutions and still be fabulous. 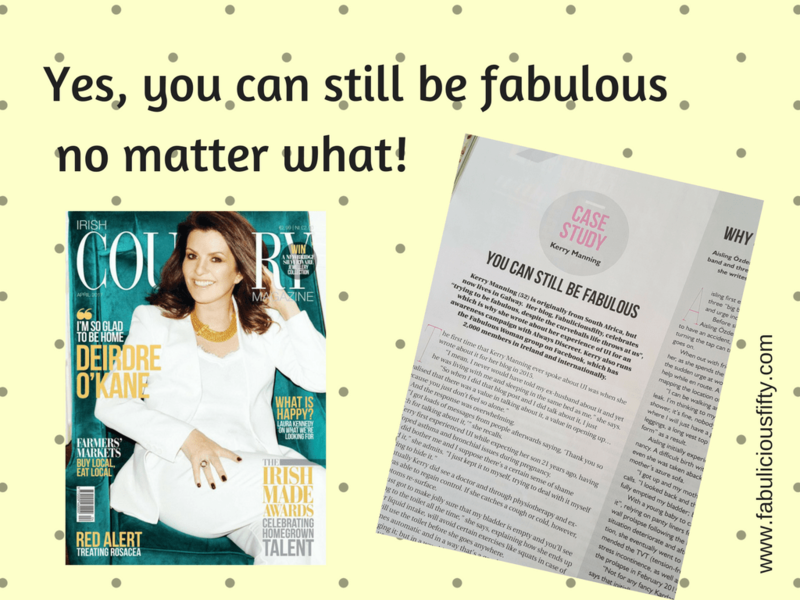 This year I was approached by the fabulous glossy – Irish Country Magazine. They wanted to feature me in an article about Urinary incontinence. Again I hesitated. I remembered the response I received after publishing the last blog post. It was all very positive. Woman were thanking me for speaking out. The latest issue of Irish Country Magazine is on the shelves this week and my little case study is featured. It is an honour to be included and ‘you know what’ I am proud to be talking about this important subject. We do all deserve to be fabulous no matter what is going on behind the scenes. Thank you so much for continuing to read my blog and to support me. What does happiness mean to you. It is different for each and every one of us. The one thing I know for sure is that we deserve to be happy! For a good while I didn’t know what happiness felt like and when, one day I was sitting alone drinking tea and eating a scone I realised that I was happy, and that I deserved to be happy. 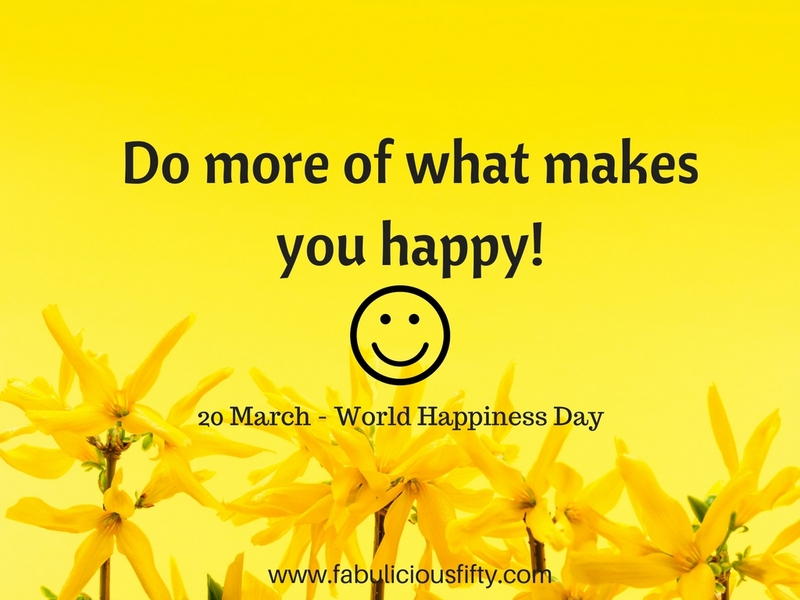 Today is World Happiness Day and I am celebrating by doing a little more of what makes me happy. I have been for a swim, I have cooked a yummy pot of tomato and roasted red pepper soup and I am simply being me. This evening I will find time to make art and of course spend time with human and furry people who mean so much to me. I have even arranged a Skype call with my son who is busy with college. Imagine if we made a conscious effort to do one thing to make both ourselves and others happy every day. I bet it would be a wonderful ripple effect and make each day a little brighter. Thank you for reading my blog – which makes me happy! I am body confident. But, it hasn’t always been that way. The irony is that when I had no confidence I actually was within a normal weight range, was much younger, and probably on the surface had a lot going for me. Inside though my confidence – or lack of it messed up so many relationships, fuelled an unhealthy relationship with food and contributed to depression that was my black dog for many years. Now I am 52, overweight, a few grey hairs, a few wrinkles and I have body confidence. What really changed to give me body confidence? What really changed? I have given this a lot of thought. I have waded through photographs of myself taken over the last 50 odd years looking for answers. The only answers I got were that over the years my body has got less perfect (when measured up against the norm). If the answer wasn’t in physical appearance then where was it? I started to think about the people in my life at various stages. It was at this point that some answers started to appear through the mist. Where were the people who loved me unconditionally? Where were the people who believed in me wholeheartedly? It is very important to make a statement here. Each person’s belief system is unique and individual to them. Belief is the subject of another blog post in the future, but what I really want to emphasise here is that it wasn’t about the people who supported or believed in me, it was about my perception that they did. Even if someone loves you unconditionally and supports you – and you don’t feel it or believe it then it doesn’t count as far as body confidence goes. You need to know that there are people around you that support you. It needs to be obvious support. Compliments, affirmations lots of positive feedback. Of course this is only part of it. A huge part of body confidence comes from within. That within needs feeding though. It needs feeding by others and by you. The media is constantly showing us unrealistic beauty. We know it is airbrushed, but regardless this feeds into negative self-confidence. It is more than just the media though. People who are around you can affect the way you feel about yourself, especially if your self-confidence is low. I have to share a little story about just that. I was visiting my sister in Dubai – which is hot! She said I must definitely bring a swim suit. Well I hadn’t worn one in years. I bought one online and felt very self-conscious wearing it. I wrapped myself in a sarong and towel and headed outdoors for a dip. The only ‘person’ around was the cat! Well you know what cats are like – he looked me up and down and I felt awful. Because, my inner self-confidence was in shreds. My request today is that you decide to be the person that builds other people up. This is more important even than remaining neutral. Young girls are having issues with body confidence all the time. They compare themselves to others, to people on TV and on social media and are made to feel that they are not good enough. Although I know that self-confidence must come from within, I strongly believe that feeding anyone with a diet of compliments, positivity and unconditional friendship will go a long way to building body confidence. I am so grateful to the people in my life, from boyfriends (and yes I mention this first as you need a lot of body confidence to get naked), family, friends and colleagues who have spent the time to like a photo on Facebook, and tell me I am looking good. The times when someone has complimented me on what I am wearing or told me how a blog post I have written has helped them. Feed your friends a diet of positivity. They will really appreciate it. I know for me once I heard it often enough I started to believe it and that is when the shift happened for me. There were other tools I used including counselling too. It is never simple, but it has to start somewhere. Receiving a compliment is a great place to start. This body I stand in today is mine, and I am proud of it. Every dimpled cellulite bump, wrinkle and pound. Even my freckles which I have been trying to get rid of for years. I have body confidence but it took a long time to get it. 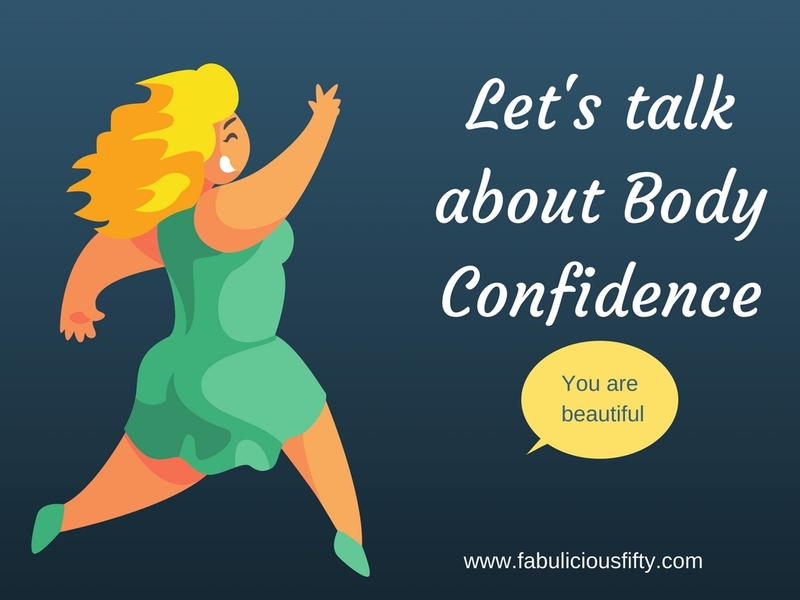 Thank you for reading and please feel free to share so we can spread this message about body confidence around the internet. Get up and Go – I am excited! Get-up and Go – how many times have you asked for a little of that. I know I have. Days when I am tired, or simply not motivated. I hear a voice in my head – Kerry, just get up and go. Well it seems that the call has been answered. I am delighted to be attending the Get up and Go event in Sligo on 21 and 22 April. 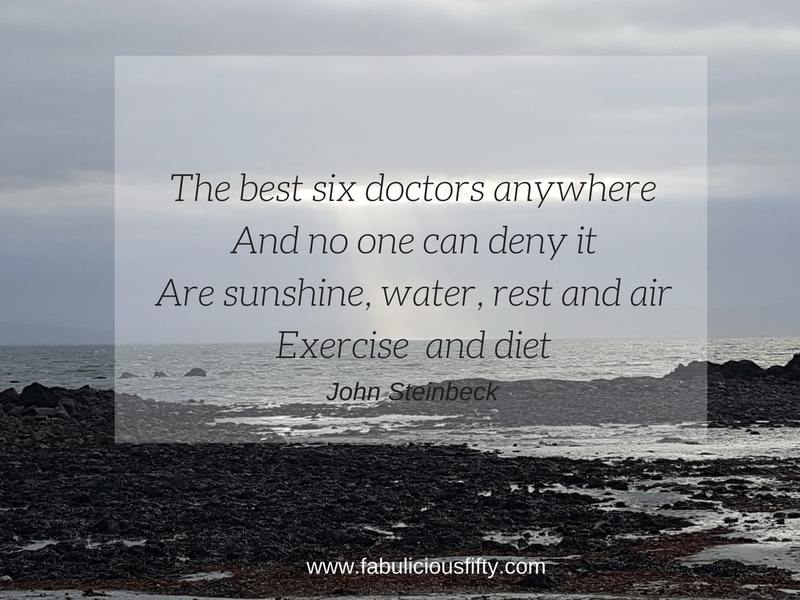 I will be spending two days in a beautiful setting in County Sligo listening to some of the most inspiring speakers and most importantly tapping into my own get up and go. 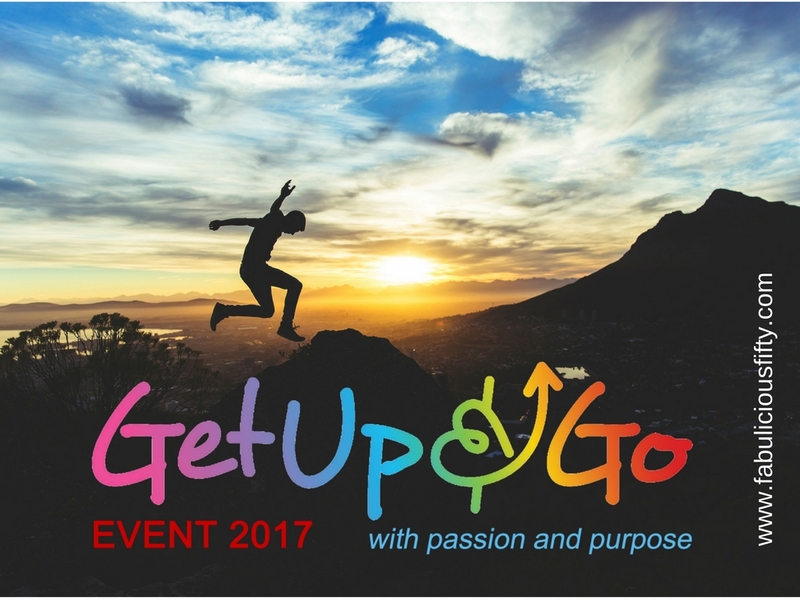 The Theme for 2017 is Get Up and Go with Passion and Purpose. It was chosen to inspire everyone to think about what you are truly passionate about and to discover how to create purpose in life by living true to your passion. Spend two days listening to wonderful inspirational speakers in their own unique style of ‘get up and go’. Speakers and topics range from business, adventure, entrepreneurship, confidence, education, health and well-being. All with the intention to inspire, motivate, encourage and empower the audience to ‘get up and go’ in life, especially in areas where they might be ‘stopped’ or stuck. ‘Our speakers this year show us how, as ordinary people, we can courageously step outside of our ‘comfort zones’ to pursue what is important to us, and be a demonstration of life lived in accordance with passion and purpose”, said Eileen Bennett organiser and publisher of the now famous Get up and Go diary series.. I am one of those people who suffer from serious FOMO (fear of missing out). There are often great events on in Dublin or abroad, that I simply can’t get to for one reason or another. This time there is a unique opportunity to listen to some amazing speakers at an affordable price point and within reach. Sligo is a spectacularly beautiful location on the Wild Atlantic Way, with scenery that has inspired artists for years. I will be snapping images for my upcoming art exhibition as we travel north for a two-day event that promises to shift thinking. This is really an event with a heart. It is a not for profit event with four charities that will receive support. I am guessing that there will be many more people who will be benefiting from simply attending, listening to the speaker and tapping into their get up and go. Hope to see you there, and watch this space for a report back. I have my notebooks ready and know I will return inspired. This is a sponsored post in conjunction with the Irish Blogger Agency. But, to be honest I would have written it anyway, it is an event that is just up my street! I am counting the days. I am proud of being a woman. It isn’t an easy job, but it is certainly one worth doing. I am a Mom, a sister, a daughter and a friend. I am also a girlfriend, a colleague. I am a marketer, a blogger and a writer. Most of all though I am strong. I am plus sized. I battle with my weight. I battle with my health, and I have a history. All of this just makes me stronger. If there was one piece of advice I could give today – International Women’s Day it would be to value yourself. If every young girl today, growing up with the pressure of social media and the celebrity culture could understand her true value she would be guaranteed to grow into a strong and beautiful woman. Today it is International Women’s Day and I am celebrating women in my life. Those that have touched me in small and big ways and inspired me to keep going and to believe in myself. I am also celebrating me. 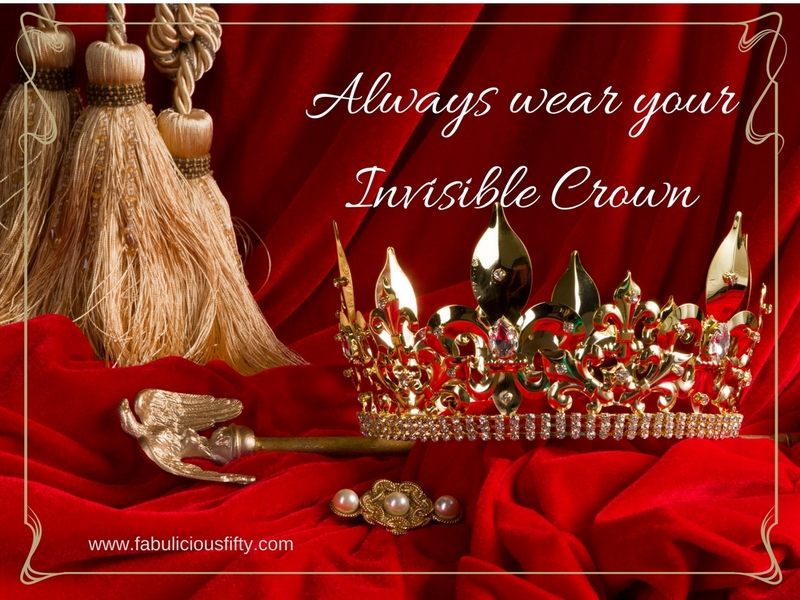 Wearing my invisible crown and knowing that I am worth it. Stress is part of my life. It is part of all our lives and relieving stress is high up on my list of things to deal with. Over the past couple of years I have learnt to deal with my stress better. To be simply be more ‘in the moment when it comes to day-to-day life. If I am upset over something I stop and breathe. Simple I know but it has made a huge difference. When I received news of the Hayo’u range of products I was intrigued. I wanted to know more about a pamper product that seemed to understand where I was in my life. Rather than a range of products I was introduced to the Hayo’u Method. The system is designed to tackle stress levels and make you feel and look younger so a win in my book. The package of samples (thank you so much) arrived. Are these going to be any different to other bath and pamper products. I had to wonder. They are so very different that I have to attempt to explain the sensory experience that I have had, and continue to have using this method. The first of my senses was my sense of smell. I love oils and the combination of lotus flower and frankincense. And combined with the healing properties of Himalayan pink salt it is just heavenly. The first product I used was the shower gel which immediately invigorated me. But, as I was road testing the product I needed to follow instructions. Each product comes with a little insert which introduces you to the one minute breathing exercise. This little ritual is rooted in the wisdom on Chinese medicine and helps you to focus inwards and calm your mind. As you breathe in the gorgeous aromas you are drawing out physical tension and inviting in calm. I love the instructions – Expel – the stale breath, Descend as you breathe in and then as you exhale – Smile though your whole body. Try it – it feels great and puts me in a happy place. After trying the shower gel I was ready for a bath, but waited for the following day. I normally shower but I have been treating myself to baths quite a bit especially since I have been in a bit of pain. The reason there are none of my own pics for this blog post is that I have used up all the bath product! A gorgeous oily salty pink pile that I used both as a bath salt and a bit of a scrub. As if that wasn’t enough there were two more packages in the parcel. The Hayo’u Beauty Restorer De-stress Face Tool a beautiful jade specially shaped stone, and a little bottle of gorgeously aromatic Treat-Rite De-stress Face Oil. The two are used together to stimulate energy points and release congestion and toxicity. I have included the video link so you can see how it is used, but let us just say I am addicted. The experience is wonderful with the fragrance from the oil and the cool pressure of the jade stone tricking me into believing I am in an expensive spa. It is easier to watch the video than to try to explain how this all works. As a blogger I get asked to try products fairly often but I only write honestly and write about products that I really love. This little parcel has already brought me so much joy and relaxation that I have no hesitation in recommending it. 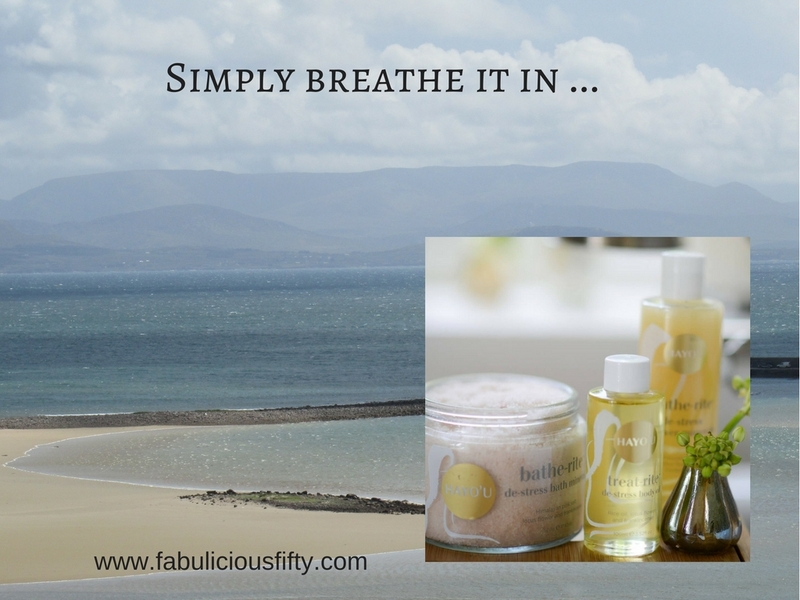 These are not budget products, however I really think that they are simply fabulous and worth a treat to yourself. 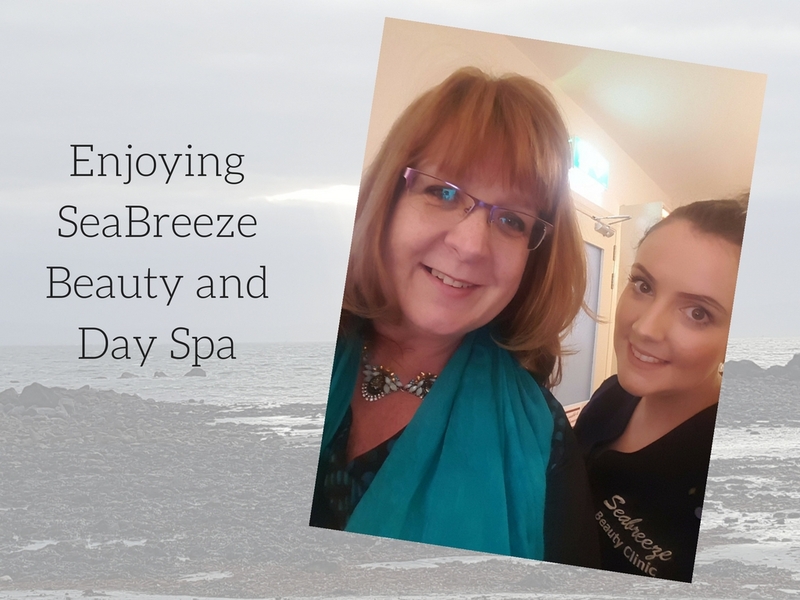 Thank you so much for reading and promise me that no matter what products you use, please treat yourself to a relaxing bath – it is something I think we all neglect. Lie there and simply breathe. p.s. I was gifted these items to try, but my review is from the heart. Proudly Plus-sized and blogging about it! For a long time I have been considering blogging about being plus-sized. There is no reason why your size should stop you being fashionably fabulous. For Christmas a couple of years ago my mom gave me a gift voucher to a fashion store. Now, it is not polite to ask someone how much the voucher is worth. When I was in the shopping mall I popped into the store and asked the assistant if she could let me know how much I could spend. I was speechless! Walking away from the store I felt less than fabulous and frankly upset and shocked. Once I started to think about it I got mad. This shop stocks fashion, shoes, handbags, fabulous accessories and lingerie. They are also known for having a plus size department. It was made apparent that this particular branch didn’t stock the plus size range, but that was no excuse for the rude and frankly hurtful manner in which I was addressed. I could easily have chosen to spend my voucher money on earrings, and a gorgeous necklace or scarf. The last time I checked my ears and neck were not plus sized. A standard handbag also seems to fit me – in fact I like small bags. I don’t want to sound bitchy, but really!!! I did complain, and I did receive an apology. It did get me thinking though of plus-size fashion, and especially the role accessories play in giving an outfit that fabulous touch. It was instances such as this that helped me to make the decision to introduce fashion and style into my blog. I am delighted to say that I will be attending Ireland’s got Curves a fabulous event which being launched by Miss Curves Ireland, SharonD. For many of us who struggle with our weight we are made to feel less than fabulous by mainstream shops. Many of my photographs (by the lovely Natalie Greer) show my head and shoulders (my best bits), but this photo shows almost all of me. I am not going to shy away from showing my wobbly bits, after all they are part of me. It is for this reason and my own experience that I have decided that I will embrace fashion blogging, as a plus-sized and over 50 fabulous woman. Please come and visit my blog again and also follow me on Instagram – DynamicKerry – where I will be showing off my style! You have made the decision, you are going to dip your toes into online dating. So, what next? It is scary. But, what might happen? Online dating in your 50s might lead to you the man (or woman) of your dreams, or you might meet a really good friend. Or, you might meet someone who is nothing like he said! Be honest. When putting up your own profile be honest. After all if you take it a step further any little white lies will be exposed. Don’t feel that you have to put up every little detail about yourself, but do think of the information you would like to get from reading someone else’s profile. Also be brave. Do put up a photo. When I started online dating I was so unhappy with the way I looked I didn’t put up a photo. I started chatting to a lovely guy and we really got on well. We even progressed to a phone call, and still I wouldn’t let him see what I looked like. Eventually I sent a picture to his phone. I literally held my breath for the time it took him to get back to me, petrified he would run a mile. We all have wrinkles and are getting a bit older. We have bits that are not where they were twenty years ago. Women lie about their age and men lie about their height. If you are serious about dating, be honest and be brave. If he doesn’t like the look of your photo or your description of cuddly, then he is not the man for you. Keep your photos simple – a nice headshot with a smile. Do not put up family photos. I think this is really inappropriate. Don’t put up photos of your home or your surroundings. Keep it simple if you connect there is plenty of time for more detailed photos as you get to know someone. Conversely I think a profile with a nice clean smiling photo is what I am attracted to. I really don’t want to see a photo of your ex! What to write in that first message. The content of your profile – and the profiles that you are looking at are the key to starting a conversation. Yes, it is always awkward taking the first step and saying hi. They way I look at it, it is better to make the approach than simply wait to be approached. I must be a modern women. (Although I do have memories of the mantra of going to the disco at 14 and saying that the guy must ask you to dance, and he must ask for your phone number) – I am delighted that times have changed. I think at this stage we are all a little afraid to make the first move, but I say, just do it. To send the first email missive across the internet is brave. But what do you say. My recommendation is to say something about them. Read their profile and comment on something they have said. Ask something more that relates to their interests. Mention something that happened recently in your area or internationally, and ask an opinion. This is a great way of finding out if they have an interest in, and if they have opinions on politics, sport etc. The most important thing to remember is to ask an open-ended question. Something that cannot be answered with a simply yes or no. Although anyone who came back to me with a yes or a no would be a no for me! I like a good conversation. Also tell a little about yourself, but not too much – you want them to come back and ask their own open-ended question. You could simply say that you finished a great book this weekend and got in a good walk before the weather turned. That way they can come back and ask about what you were reading and where you walked. There are people out there on dating sites and in pubs and real life who are not what they seem to be. Simply keep away from them. In most cases I would advise simply blocking them. Be brave – give little peaks into your life. And enjoy getting to know new friends. You never know where it could go. 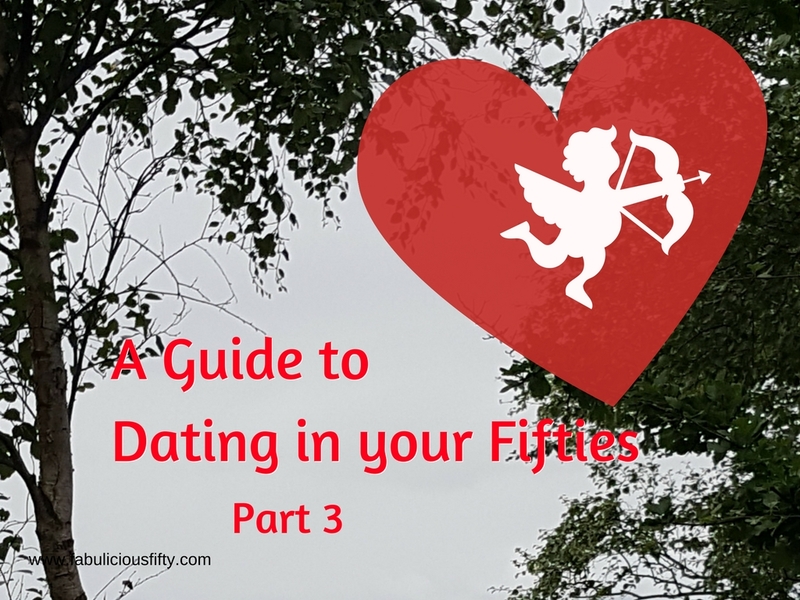 If you want to read Guide to Dating in your Fifties Part 1 and Part 2 please follow the links. If you are looking for love this February – be brave and take the plunge. I love feedback so please feel free to leave me a message.